Eccentric contraction refers to any movement that lengthens a muscle at the same time it is being contracted. It is a braking force that directly opposes the shortening of a muscle (known as a concentric contraction). By way of example, as you lower your arm in a biceps curl, that movement would be considered eccentric. The lifting of the weight would be concentric. Eccentric exercises are also referred to as negative training or negative work. They benefit muscles by absorbing the mechanical energy exerted by the heavy workload. That energy is then released with what is called elastic recoil, essentially a spring-like action that faciltates the next muscle movement. Sports physiologists believe that eccentric training can build muscle size and strength better than standard concentric-eccentric movements. By focusing solely on the downward force exerted on a muscle, you can enlist heavier weights than you might otherwise be able to lift. Eccentric training often involves a partner who aids in the lifting of a weight (the concentric movement) and stabilizes you as you lower the weight on your own (the eccentric movement). Alternately, you can focus on the eccentric movement by lifting a weight or body part quickly (say, within a second) and lowering it slowly (over three to five seconds). While an eccentric contraction uses less energy and oxygen than a concentric contraction, the negative movement actually creates more force. This not only enhances muscle growth but also increases the rate of metabolism (the conversion of calories and oxygen into energy), promoting weight loss. According to research from Wayne State University, a full-body eccentric workout increased the resting metabolism in athletes by 9 percent and for no less than three hours following the exercise. Eccentric exercise is also commonly used for physical therapy and rehabilitation. Because eccentric contractions create more force with less energy, it is less likely to overtax injured joints and muscles. This can be especially valuable for elderly people who haven't the physical capacity for traditional eccentric-concentric exercises. Anterior cruciate ligament (ACL) injuries are typically treated with eccentric exercise. The downward movement is less likely to compromise the stabilizing ligaments of the knee. Concentric movement, by contrast, places extreme stress on the joint as it is forced to simultaneously lift and stabilize the weight. Patellar tendonitis, also known as "jumper's knee"
While beneficial, eccentric contractions are not without risks. The downward force exerted on muscle can protect against injury but will likely increase the risk of delayed onset muscle soreness (DOMS). This is due to microtears that develop as a contracted muscle lengthens, causing soreness and pain 24 to 72 hours after the exercise. Repeated training can help reduce much, if not all, of the post-exercise soreness. Eccentric contractions may also pose a health hazard if you lift weights larger than your maximum capacity. 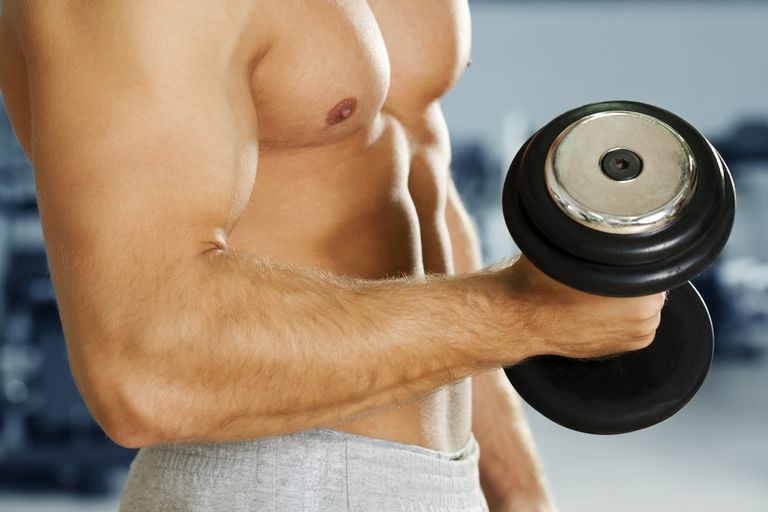 With something as simple as biceps curl, the lowering of an excessively heavy weight can cause wrist sprain, elbow strain, and shoulder injury. To avoid this, you need to determine what your ideal lifting weight is. Your ideal lifting weight is between 50 and 70 percent of your one-repetition maximum (1-RM). This is the maximum amount of weight you can lift with proper form. If your 1-RM is 50 pounds, you should lift no more than 25 to 35 pounds. Hackney, K.J., Engels, HJ., and Gretebeck, RJ. Resting energy expenditure and delayed-onset muscle soreness after full-body resistance training with an eccentric concentration. J Strength Condition Res. 2008 Sep;22(5):1602-9. DOI: 10.1519/JSC.0b013e31818222c5. Vogt, M. and Hoppeler, H. Eccentric exercise: mechanisms and effects when used as a training regime or training adjunct. J Appl Physiol. 2014;116(11):1446-54. DOI: 10.1152/japplphysiol.00146.2013.